Belarusian football is now experiencing extraordinary historic moments. For the first time ever the Union of the European Football Associations (UEFA) named a club from Belarus as the best team of the week in Europe. This happened after BATE Borisov shocked all football fans and specialists by defeating the German champions Bayern Munich in the UEFA Champions League on 2 October. Sports media across the whole world made much of BATE's glorious victory. This is one of those few occasions when Belarus features in international news without the tags of “dictatorship”, “economic crisis” or diplomatic rows. The team from Borisov has become Belarus's best envoy in the world arena. In spite of its tiny budget and little support from the state, the team is doing more to promote the good image of the country than the whole government put together. The UEFA Champions League is the most prestigious intra-European football championship. Each autumn the best 32 European teams play in the so-called group stage where they are divided into quartets. The two winners of each group then continue competing for the cup in the knock out rounds in spring. Being among the best 32 clubs on the continent is already a great achievement that few European football squads can boast of. And this is already the third time that BATE Borisov have reached this stage. But this time seems to be special. On 2 October BATE celebrated a stunning victory against one of the strongest teams in Europe – Bayern Munich. The German club were last year’s Champions League finalists and are now widely considered to be leading favourites. But in Minsk this grand team only managed to score once while BATE troubled the German goalkeeper three times. After this beautiful and unexpected victory UEFA awarded BATE the European team of the week, a title that before seemed completely beyond imagination for a football club from Belarus. The country’s place in football rankings is quite modest (currently 87 in the world) and its clubs rarely enjoy recognisable successes internationally. This is why the European team of the week title is a real landmark for all Belarusian football. BATE's history is a spectacular example of how a well-organised and hardworking team with a constrained budget can achieve great successes both nationally and internationally. The establishment of the club dates back to Soviet times. It was created as the team of Borisov Automobile and Tractor Electronics Works. The word "BATE" is an abbreviation for the Borisov Plant of Auto Crane Equipment. The team played its first official match in 1973. And already in 1974 BATE won the championship of the then Belarusian Soviet Socialist Republic (BSSR). Between 1973 and 1981, when the team ceased to exist, it won the national championship three times. In 1996 BATE was re-established. Successful businessman Anatoly Kapski became their main sponsor and also president. Several unofficial ratings rank him as one of the 50 most influential businessmen in the country. He is currently the CEO of the newly established holding Autocomponents that unites 12 companies that produce components for different categories of automobiles. BATE began their glorious march to the Olympus of Belarusian football from the lowest league. It took the club just two years to get into the Supreme League where they immediately won silver medals in 1998 and gold in 1999. Overall, BATE have so far won eight national champion titles, two Belarus Cups and two Supercups. This is an absolute record for any team in the country. BATE have also given birth to many Belarusian football stars. The most renowned of them is Aleksandr Hleb. He started his beautiful career in Borisov in 1999 and then played in Stuttgart, Arsenal, Barcelona and Birmingham. He is currently back to his native club to help it in the 2012/2013 Champions League. This is no wonder. BATE’s overall budget is about the annual salary of Bayern’s star-players. The team’s financing mainly comes from the automobile and tractor electronics works that it represents as well as from a number of sponsors that are modest by European football standards. And unlike the Belarusian ice-hockey giant Dinamo Minsk, BATE do not receive massive state support. Alexander Lukashenka likes ice-hockey better than football. One would hardly expect such a poor team to outperform a German or French football giant. And even when such a surprise happens one will usually see it as an accident and comment on it in a sarcastic way, like a reader of the British Guardian did: “the tractor boys did good”. However, football experts are now talking more and more about BATE’s great defence and skillful counter-attacking style. The names of BATE’s leading players, Andrei Gorbunov, Renan Bressan, Aleksandr Volodko, Vitali Rodionov, and Aleksandr Pavlov are becoming familiar in European football circles. The team’s play is acquiring its own widely recognisable flavour. As another reader of the Guardian put it, BATE’s performance represents “good-old football, which is untouched by merchandising and heavily defined by metallic curtains”. Through its fantastic performance on the football pitch BATE Borisov has become Belarus’ most successful diplomat in the international arena. After the games with LOSC Lille and especially Bayern, BATE were all over the sports news in outlets around the whole globe. 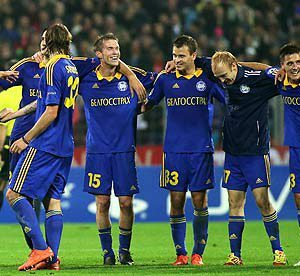 The world’s leading news agencies published materials with titles similar to that in the Indian daily The Hindu: “Belarusian side BATE Borisov caused one of the biggest shocks ever seen in the Champions League football”. This is one of the extremely rare situations where the world media massively talk about Belarus. 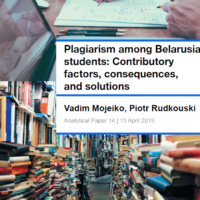 What is more important, they do it without any reference to Belarus’ notorious political realities and beyond the usual contexts of electoral fraud, human rights violations or diplomatic scandals. Thanks to BATE Borisov the world can see that Belarus has much more to offer. Apostolic nuncio Claudio Gugerotti is the only diplomat who can visit the Belarusian prisoners of conscience. The Holy See seems to work as an intermediary between the European Union and Lukashenka with regard to release of the political prisoners. The nunciature tries to keep their profile low and refuses to give details of the visits to prisons. The secrecy of those visits may hint at the seriousness of intentions. On 3 October, Claudio Gugerotti met with the Pope to discuss the latest events in Belarus. The nuncio visited seven political prisoners last month: ex-presidential candidate Mikalaj Statkevich, chairman of the human rights organisation Vyasna Ales Byalyatski, co-chairman of the Belarusian Christian Democracy Paval Syevyarynets, Young Front leaders Zmitser Dashkevich and Edward Lobau. He also met anarchist Pavel Syramalotau and activist of the Conservative Christian Party of the Belarusian Popular Front Syarhei Kavalenka. It is notable that the Belarusian authorities released the latter two after the meeting with the nuncio. Besides, Belarusian analysts have often expressed the idea that the Catholic Church would have been a perfect intermediary in Belarusian-European relations – an opinion shared by some politicians in the West. The position of the Catholic Church in Belarus is unstable. On the one hand, the Belarusian Catholic Church effectively develops: builds new churches, organises mass pilgrimages to holy places and religious camps. 12 per cent of Belarusians consider themselves Catholics and every second Belarusian visits church regularly. The Catholic pilgrimage Budslau in Northern Belarus is considered to be the key religious event in Belarus. Christians of all denominations take part in it. On the other hand, Belarusian Metropolitan Tadeusz Kondrusiewicz knows that the Belarusian Catholic Church can develop only if the authorities allow this. Therefore, the Catholic Church has to remain loyal to the regime. But discontent with the policy of the Catholic Church administration is growing among the ordinary priests. Fathers Piotra Rudkouski and Yury Barok have many times condemned in public the silence of the Catholic Church authorities when the regime beats people and illegally sentences them to long terms in prison. Nonetheless, the official line of the Catholic Church remains the same. In 2007, relations between the Catholic Church and Lukashenka significantly improved. At that time Pope Benedict XVI appointed Tadeusz Kondrusiewicz as Metropolitan of Minsk and Mahileu. The new Metropolitan soon found understanding with the authorities which made conditions for development of the Catholic Church in Belarus more favourable. However, this development was achieved at the price of loyalty to the Belarusian regime. In 2009, the Pope officially received Lukashenka in the Vatican after long years of isolation. He was the first in Europe who did so. Naturally, Lukashenka is thankful to the Catholic Church for that. Lukashenka keeps saying at the meetings with the official representatives of the Catholic Church that there is a need for closer cooperation between Belarus, the Holy See and the West. Last November, Lukashenka said to Kurt Koch, President of the Pontifical Council for Promoting Christian Unity, that he expected “from the Catholic Church and from Pope Benedict XVI personally more integration with regard to defence of our interests, especially in the West”. This April, Lukashenka mentioned to the current Apostolic Nuncio Claudio Gugerotti that “the Catholic Church’s work on making the relations between Belarus and Western Europe is incomplete”. It is obvious that Lukashenka really wants to see an influential ally with minimum political ambitions beside him. This ally should also depend on him in some way. The Catholic Church meets these criteria perfectly. Why Do They Need an Intermediary? Brussels does not trust Lukashenka anymore. It is clear that the “dialogue 2008-2010” and its sudden interruption cost a lot to European politicians. The European Union does not want to hold direct negotiations with Lukashenka. Back on 26 August 2011 Bulgaria’s Minister for Foreign Affairs Nikolay Mladenov arrived in Minsk with a mission to talk to Lukashenka. Lukashenka promised he would release all political prisoners soon but failed to keep his promise. Brussels is tired of “spinning Minsk round”. The European decision-makers built their Belarus policy on the basis of a search for dialogue and compromises which could lead to at least minor political changes. Today Brussels is tired of looking for common points and the new approach is “if Lukashenka wants it, we want it too”. This is why Lukashenka decided to establish relations with the Apostolic Capital himself. Today, the Catholic Church is a perfect intermediary for Lukashenka. Belarusian analysts think that positive sides of the Apostolic Capital as an intermediary are great experience in negotiations and non-essential political ambitions. However, there’s one more aspect, which no one mentions for some reason – the Catholic Church in Belarus is Lukashenka’s hostage. Apostolic Nuncio Claudio Gugerotti probably knows that Lukashenka will not go for reforms, but the Catholic Church sees its own advantages. First, the Catholic Church as an organisation based on morality wants to facilitate release of political prisoners. Second, although release of several political prisoners is not a great achievement, it will positively affect the reputation of the Holy See. Third, Lukashenka will pay back by letting the Belarusian Catholic Church develop freely. It is worth mentioning that Belarus has its own very simple political cycle. If Russia is ready to supply energy resources at low prices to Belarus, Lukashenka will destroy the opposition by any means. If Russia demands that Belarus should pay more for oil and gas, Lukashenka starts slow liberalisation and the Belarusian prisoners of conscience come out of prisons. Relations between Lukashenka and Putin are getting worse again. The Russian authorities demand that Lukashenka respects his own commitments. In the first place, this concerns privatisation and no more sales of oil products disguised as solvents. Belarus is not obliged to return taxes to the Russian budget when it sells oil products this way. In such conditions, Belarusian authorities will seek support in the West. Belarus’ foreign minister Uladzimir Makey even had a short meeting with the U.S. Secretary of State Hillary Clinton last week in the United States. Naturally, the former head of the presidential administration had some serious business to discuss with Clinton. Therefore, the time for Lukashenka to release political prisoners has come. The Belarusian authorities will not do it massively in order not to lose face. However, several political are likely to leave their prison cells soon.